Squamish Amateur Radio Club Annual General Meeting 2018 will take place on Saturday November 17, 2018 at 10 am at the Burger King, Squamish. On September 30, 2018 members of Squamish Amateur Radio Club, and ARES were invited to participate in the annual Squamish Fire Rescue’s open house event. The purpose of Radio team was to create awareness about the crucial role amateur radio plays during an emergency or disaster when regular communications infrastructures are disrupted. Multiple handouts were provided to public with information about amateur radio, and emergency preparedness. SARC members established communications via VHF (Simplex and Club Repeater), HF voice (10 Watts on 80M with Keith VE7GDH on Salt Spring Island), Digital HF (FT8 mode, and WSPR running in real time), and APRS. An end fed antenna, a magnetic loop, and mobile vertical antenna were successfully utilized for operations. Many young children were very excited to talk over the VHF radios. Participants in this event were John VE7CUU, Gursimran VA7GUR, Cameron VA7JT, Tom VE7NG, and Wayne VE7SWR. The 2015 Annual General Meeting was held Saturday November 14. Congratulations to Cameron, VA7JT, on being elected Club President. 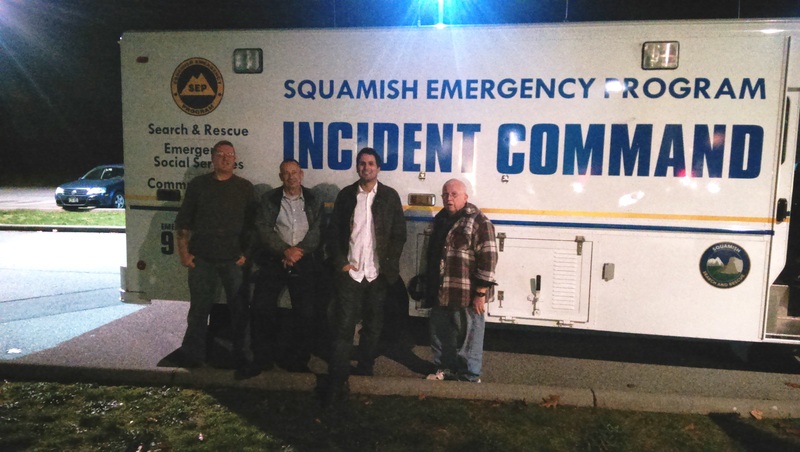 Club members attended the Squamish EOC last night to participate in the monthly PEP HF net. The Incident Command vehicle was on-site and members assessed the capability and readiness of the HF radio equipment on board. Findings and opportunities for improvement were communicated to the District representative. The 2m repeater is back to 100 Hz tone for access. (It was previously set to 67 Hz for testing). Changed the CW ID trigger to activate only when a carrier and tone are received. The CW ID should now only transmit if there has been “legitimate” repeater use during the previous 15 min interval. Increased RF power output. Increased the transmit radio output to 15w (measured at the antenna output connector on the duplexer). The 2m repeater is temporarily relocated to Debeck Hill to see if a different location solves the interference issues we have been experiencing. A 67hz tone is needed.